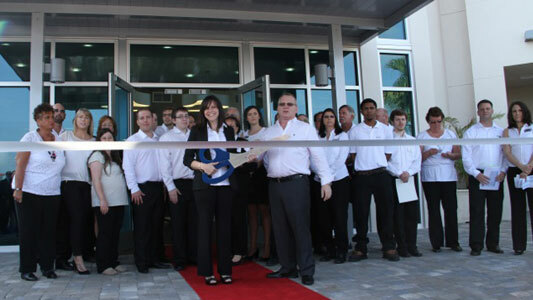 Bradenton, FL—April 3, 2013—IRISS, a leader in the industrial infrared (IR) window market for electrical safety, announced today their new global headquarters officially opened. This day coincided with the first annual Global Industry Day publicized in Manatee County. Guests toured the 33,000 square foot facility which features an executive conference room, state-of-the-art training room, corporate offices & collaboration station, and a LEAN manufacturing facility on a four acre, lakeside lot in Lakewood Ranch Corporate Park. IRISS executive conference and training rooms are available to the public for rent. Additionally, their LEAN manufacturing facility utilizes in-house rapid prototyping for their Custom Solutions IR windows. This service will be available for other businesses, promoting innovation of new products within the local community. IRISS industrial-grade infrared (IR) windows give customers an efficient way to safely inspect electrical equipment without exposure to the risk of a hazardous arc flash, accidents or injuries. Our unique window designs feature a durable, clear polymer lens that allows visual, UV and short/mid/longwave IR spectrum inspections and are available in custom shapes and sizes to fit the needs of any application. Through our Safety and Maintenance Academy of Reliability Technologies, IRISS offers many unique training and certification classes that provide the practical experience and knowledge necessary to complete electrical maintenance inspections safely and efficiently. For more information, visit www.iriss.com.